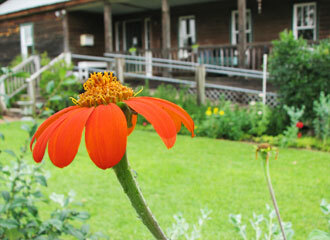 The Southern Heirloom Garden is located in front of the old farmhouse (Walden House) which was the original DABG Office. An heirloom garden is not planted to be showy and spectacular, but rather a collection of bygone plants that have been over-looked or forgotten with the arrival of hybridization. Early Spring heralds the most intense color with Poppies, Larkspur, old roses, and Confederate Jasmine, followed in Summer with Petunias, Zinnias and Black-Eyed Susans. Most of the specimens in this garden were collected throughout the Southeast from family gardens, old homes, and even along roadsides!